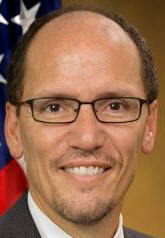 Obama Picks IT Nemesis Tom Perez to Be Secretary of Labor, 3/18/2013. March 18, 2013. President Obama gave a speech in which he announced that he will nominate Tom Perez to be Secretary of Labor. Perez is currently Assistant Attorney General (AAG) in charge of the Department of Justice's (DOJ) Civil Rights Division (CRD).